It’s the little things that stress a lot of people out. A few years ago I was watching a hockey game in my hometown of Edmonton, Alberta, the Oilers vs the Leafs. These were the pre-Taylor Hall days and were quite dark indeed. But instead of worrying about the outcome of the game, I remember feeling angst during the anthem as one of the players vacated the blue line to skate a lap by himself as he strapped his helmet on. What’s happening here? I remember thinking. Sure enough the rest of the players followed suit. How did they know when to leave? Could they read each other’s minds? I wasn’t concerned with the inevitable demise of my beloved Oilers – no, I was stressed out because I couldn’t figure out how the players knew what to do before the puck was even dropped. Brainstorming ideas for this piece, it dawned on me – from the players to the anthem singer to the men and women with cameras on the ice, the professional hockey pre-game procedure is old news for those involved. It’s easy to get the timing down because they’re all veterans. Initiation hockey, on the other hand? Walking into an initiation hockey dressing room is like walking into one of those restaurants where they shut the lights off and make you eat in the dark. It’s not complete chaos, because everyone is worried about personal space (or maybe that’s just me), but if someone from another country who didn’t know what hockey was walked in, they’d probably call the riot police. And we haven’t even hit the ice yet! It’s easy to lose patience when you’re more accustomed to junior or major midget or even peewee hockey. All those levels have some structure, but they had to learn that structure somewhere. Can you guess where? Initiation! Know Your Role: speak clearly, carry yourself with confidence, have fun, and remember, dad jokes are your friend. In initiation hockey there’s no frame of reference to draw on for both the kids and the parents. You can’t simply refer to last season to decide what sort of practices to plan, and the parents aren’t sure what they think is good and what they think is bad. But that won’t stop them from telling you. 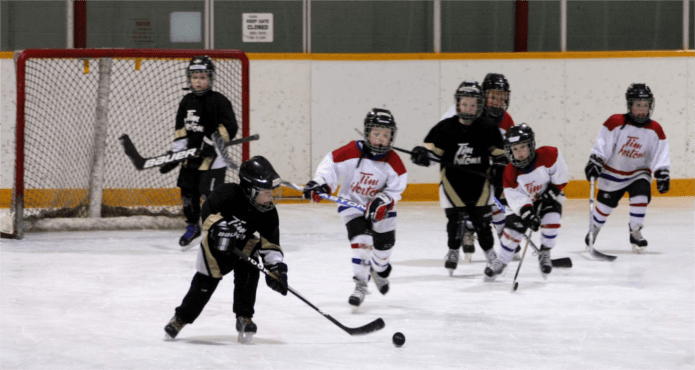 Sure, there are multiple levels of initiation hockey in most organizations, but referring back to the chaos is only going to invite more chaos. No, it’s better to start with a clean slate and design practices based on what you believe is best for the kids. If you need help with that, I wrote about systems vs skill development last month. Know Your Role: The more fun it is, the more the kids will learn. While you’d probably have better luck conducting an opera formed exclusively of cats and dogs than you would requesting your players stand in line and pay attention for more than 6 seconds, the secret role of an initiation coach is to get the parents on board. You see, this is mostly new for them. They’re caught up in the fact their child’s hockey “career” is just beginning, and they can’t wait for them to be allstars chasing glory for their team. Well, it will be another couple of years before the real hockey begins, and the parents are impatient. The kids don’t care (because they’re unaware of what’s to come), but the parents do. Know Your Role: lead and they shall follow. Probably. Maybe. I don’t know, will they? The only way you can truly succeed and keep your sanity while coaching initiation hockey is to focus exclusively on the kids. The parents will either buy in or they won’t, but that’s out of your control. If you can help your players enjoy the game more than they did at the beginning of the season, then you’ve truly made a difference in their lives. And that’s what it’s all about: making a difference. Alright, time for practice, where’s my dog whistle?